The Taylor 414ce Grand Auditorium V-Class Electro Acoustic Guitar offers an outstanding instrument that is perfect for anyone and everyone from recreational players to gigging professionals. The exquisite craftsmanship that we've come to expect from Taylor can be experienced across the 414ce, whilst carefully appointed hardware maximises playing consistency. Whether you're kicking back and playing along to your favourite tracks at home or hitting the road on a lengthy tour, you'll want this beauty to accompany you. Each model is supplied with a Taylor Deluxe hardshell case to keep it in pristine condition, wherever your music takes you. The 414ce is shaped to Taylor's highly versatile Grand Auditorium body profile, which balances comfort and power to perfection. Sitting between the larger dreadnought and smaller Grand Concert in size, the Grand Auditorium boasts a sleek and comfortable figure-hugging feel. Thanks to the Venetian cutaway, your fretting hand can reach the highest parts of the neck with ease. Whether you prefer to play with a pick or opt for a fingerstyle approach - a like to mix it up by shifting between both -, the 414ce welcomes one and all. The back and sides are built using ovangkol, which is a hardwood that shares many of the same properties as Indian rosewood. Producing a rich mid-range timbre that dips into the low-end as well as touching upon crisp highs. Paired with this is a Sitka spruce top, which offers a nuanced output to complement the well-rounded character of the 414ce. The natural finish shows off the vibrant grain of the spruce in all its glory. A protective application of gloss allows the woods to age gracefully. 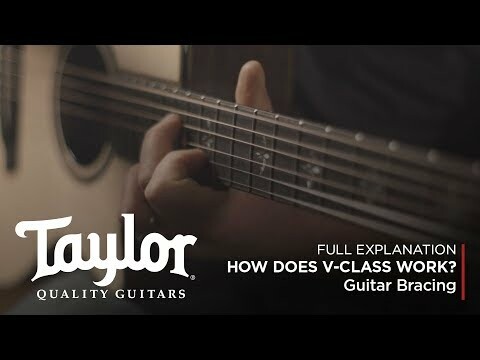 Taylor's revolutionary V-Class bracing pattern increases soundboard flexibility and stiffness in equal measure. The result is improved resonance, which is allows the soundboard to generate greater projection for increased efficiency and dynamics. Secondly, thanks to the stiffer properties, the spruce preserves string motion for improved sustain so that notes ring out for longer. Finally, the V-Class bracing pattern affords masterful intonation. Therefore, whether you're fretting a chord near the nut or closer to the bridge, each note retains perfect pitch. Joined to the body is a stable and reliable tropical mahogany neck, which is afforded a shapely profile that sits sweetly in the hand. A delicate yet resilient layer of satin ensures that you can glide along the neck unimpeded by stickiness or tackiness. Married to the neck is a glorious ebony fingerboard, which features century position inlays to guide your way in style. The Venetian cutaway removes any obstacles between your hand and the upper frets, giving you total freedom to explore the neck in its entirety. The 414ce electro-acoustic is equipped with Taylor's proprietary Expression System 2 (ES2) electronic setup, which translates the rich timbre of the guitar via a uniquely designed behind-the-saddle pickup and custom-designed "professional-audio"-grade preamp. From the bellowing depths to the searing highs, the delicate intricacies of each note are captured and translated impeccably. Thanks to the intuitive control layout, you can deftly sculpt your output to suit your playing style and performance environment. The Taylor 414ce Grand Auditorium V-Class Electro Acoustic Guitar is home to Taylor nickel tuning machines, which ensure that each string stays firmly in tune throughout the most enthusiastic of performances. The Tusq nut and micarta saddle play their part in upholding intonation and sustain, whilst fine finishing touches including the grained ivoroid/tortoise/grained ivoroid rosette elegantly complements the finish.